If you’ve never taken a vacation that is totally focused on reading but totally want to, this is the blog for you! I’m one of those people that live and breathe by their planner. I’m sort of, kind of, really obsessed. It’s color-coded, doodled in, extremely worn, and loved. So, imagine my surprise when I started to notice that there were not a whole lot of pages left for this year. Where has 2018 gone? One moment we were in the thick of it and the next it’s almost over! Talk about stress-inducing. You know what I need? A reading vacation. What’s a reading vacation you ask? It’s a time once or twice a year where I give myself a specific amount of time to relax with my all-time favorite hobby, reading books. I already know what you’re thinking. How do I do that? My life is so busy, where do I even find the time? What do you even do on a reading vacation? 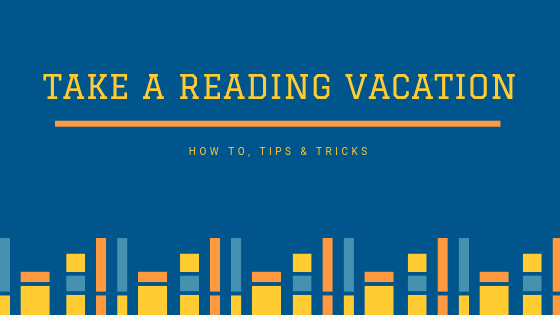 Well, here are some of my tips and tricks on how to take a reading vacation and make the most of it. It doesn’t have to be today. It doesn’t have to be next week. Take a look at your schedule and make time for yourself. Answer to nobody but yourself. You can take a little as one day off from your life to read or take a whole week. Maybe you have some vacation time to burn, this is your chance! I typically make this super easy on myself and will set aside my days off for two whole days of no other responsibilities than to read. Again, answer to yourself. Wanting to keep expenses down? Do a staycation at home. There’s nothing better than relaxing in your favorite reading nook. Craving a little bit more adventure? Stay at a mutual book-loving friend’s house, book a hotel room in town, or even book it out of town for some real R&R and put everything else in the rearview mirror. You could even do what I do when I decide I want a staycation reading vacation, do all of your reading outdoors. Go for a hike to a scenic spot for the day, go to the park, hide out in your favorite bar or coffee shop. This is the easy part. Pick what you want to read. Your reading vacation should be about finally sitting down and devouring that book you’ve been wanting to read forever. Maybe you’ve had your eye on a bestseller or maybe you have a growing stack of books in your TBR pile. Either way, don’t saddle yourself with books that you only sort of want to read, this is your time to just do you. No judgment. If you’re still having trouble figuring out what to read, join a book club. At Bookmans we have a plethora of book clubs to choose from depending on your location, as well as a book club Facebook group! What’s a readathon? These typically take place online, so if you’re looking to COMPLETELY unplug during your vacation this isn’t for you. Readathons can be as short as 24 hours and as long as a month and are often themed. These are events with specific goals and times but are often extremely chill and lowkey. This is a great way to connect with readers across the globe and also read some books that you may not have originally reached for. Check out this list here by Australian book blogger/vlogger Little Book Owl for all the readathon’s happening during the month of November. Now go out there and read! We’ve got six stores across Arizona that are filled with great reads. If you’re interested in joining any Bookmans Book Club, email bookclubs@bookmans.com or our Facebook group for more information.